For custom tags only: please indicate the number of the tag you would like (see listing pictures for options and numbers) and the text for the tag - Thank you! Looking for the perfect, unique gift to give your guests? This listing is for 30 succulent favors in white pails! Order now, before they sell out - we can ship them later, to arrive closer to your event. - 30 beautiful, high quality rooted rosette type succulents already planted in white pails approx. 2"tall and 2.5" wide on the top (opening). We can ship either all green or a variety of succulents. We tuck in some moss around the succulents as needed. - Optional: 30 tags and twine (or clothespins) to attach the tag to the pail. Tags are approx 1.4" x 1.4" in size. For custom tag: please scroll through the listing pictures and select the tag # you would like to be included. 2. Leave the following in the note to seller' box at checkout. ► For CUSTOM tags only: any customization (name, date etc.). Tags can only be printed on 1 side. ► Tag hole: round, heart shaped (for twine) , no hole (for clothes pins) - twine or clothes pins are included. If you are ordering for delivery to a location with temperatures below 35-40 degrees, please add a heat pack to be placed in the shipping box to keep the plants happy (and avoid damage/freezing). I don't think there are enough words to say how happy and satisfied I am with this product!! 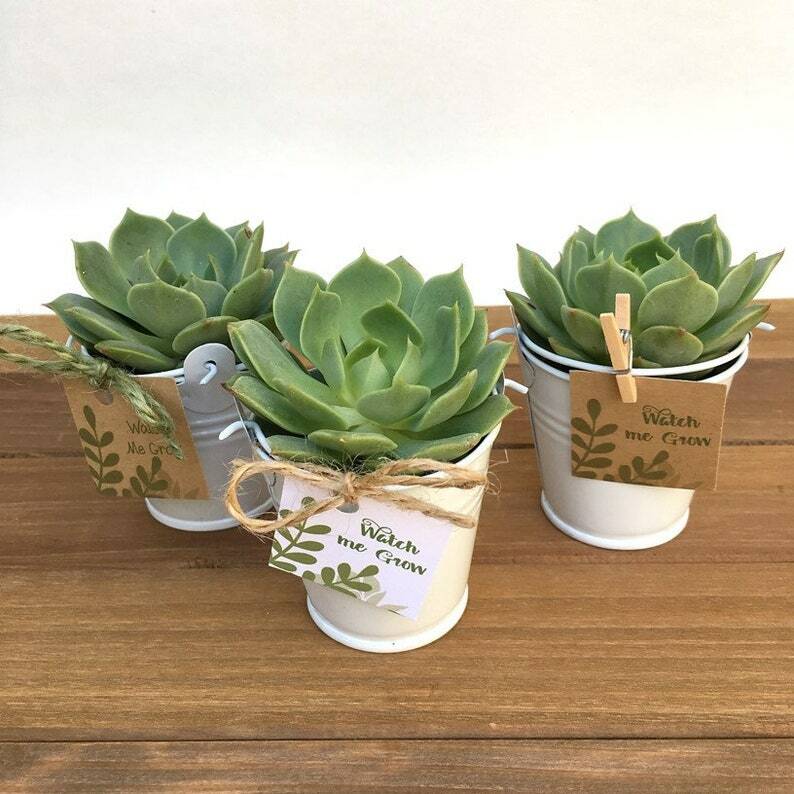 The succulents were just beautiful and my staff LOVED them as holiday gifts. I highly recommend this shop. The succulents all came packaged beautifully so they didn't lose any dirt or get damaged in shipment. And they were all in good health when I got them, with some even sprouting little baby succulents. Thank you again for a beautiful product and for your attention to detail. Much appreciated! Couldn’t be happier with the product and the service. Exactly what I was looking for. The packaging was perfect and the instructions are extremely user friendly.